Reeves&apos; voice is simply extraordinary, and worthy of more than the four Grammies she has already collected. She sings with an incredibly rich, full and well-rounded tone that is gorgeous on both the high and the low notes. Her range and depth is beyond most vocalists, combining phenomenal power with amazing restraint. She combines the delicacy of a classical vocalist with the warmth of a soul vocalist. Reeves&apos; voice can make someone fall in love in an instant, and the capacity crowd in the arena was no exception. Her beautiful singing and wild scatting captivated the audience. Overheard during Diane Reeves&apos; set: "We&apos;re going to buy all her albums when we get home, right?" For more information on the Monterey Jazz Festival, see our Monterey Jazz Festival page. 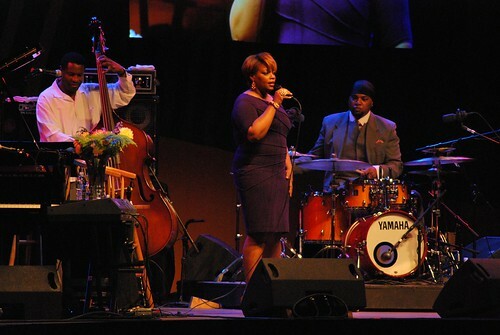 For coverage of the 2010 Monterey Jazz Festival, see all our Monterey Jazz Festival posts. For more photos from this and other performances at the Monterey Jazz Festival, see our 2010 Monterey Jazz Festival set on Flickr.